GRAPEVINE — Paisley Elliott looks like a normal kid in her kindergarten class at Holy Trinity Catholic School in Grapevine. 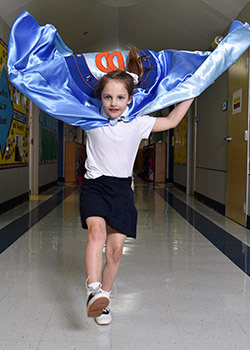 But this kid has discovered her super power and has the cape to prove it. PP stands for Paisley's Pals, an organization to help refugee kids founded by the 5-year-old and her family. Paisley’s super power? To show you’re never too young to help others. How does a little kid start an aid organization? With help from mom Tali Jones and dad Brendon Elliott and an ever-widening community of support. “I started Paisley’s Pals when I was 4 years old and I learned about refugees in school,” Paisley said. 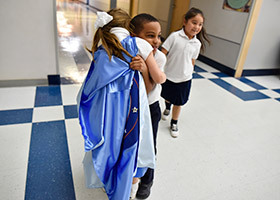 After representatives from Catholic Charities Fort Worth came to school to talk to students about refugees, Paisley, then a 4-year-old prekindergartner, came home with lots of questions. Jones showed her maps and talked with her about Syria, Pakistan, and other countries where families fled crisis situations. That night, Paisley came into her mom’s room crying, holding an armload of stuffed animals. “She said, ‘I want to give these to refugee kids,’” Jones recalled. Because of Paisley’s wish to send “lovies” to children in crisis, her family and school community collected hundreds of stuffed animals and Paisley’s Pals was born. Later last year, Paisley’s Pals collected 500 pounds of items: small toys, handmade cards, toothbrushes, disinfectant wipes, adhesive bandages, protein bars, and more to make “blessing bags” for Central American migrant families. Paisley and her family flew to Mexico City to hand out the bags at a United Nations camp for the migrant caravan inside a soccer stadium. Around Christmas, Paisley hosted a hot cocoa stand, a pancake breakfast, and gift-wrapping stations to raise $1,000, which went to the Hope and Peace Center, an outreach to Syrian refugee children at the Moria Refugee Camp in Greece. Recently, Paisley got a chance to try an emergency blanket made out of Mylar, like many refugees receive, and that started a whole new effort. Now Paisley’s Pals is making superhero capes for refugee children. Earlier this year, Paisley’s Pals put on a “Helping Heroes” event in Flower Mound. Paisley talked to a group of about 20 kids about what refugee children experience. Attendees decorated some of the 200 superhero capes that were later sent to the Hope and Peace Center for use in mental health counseling for displaced children. What message does Paisley want to send with the capes? “We want them to be happy, brave, and strong,” the 5-year-old said. The organization started by a little girl who wanted to send her stuffed animals to refugee kids is gaining attention around the world and close to home. The family recently received a notice from the UNHCR (the United Nations Refugee Agency) that Paisley was nominated for the Nansen Refugee Award, an honor given to an individual or organization “who has dedicated their time going above and beyond the call of duty to help people forcibly displaced from their homes,” according to the organization’s website. Past recipients include Eleanor Roosevelt, Senator Edward Kennedy, lawyers, doctors, and non-profit leaders who devoted their lives to helping displaced people. She said that although winning such a prestigious award would be a long shot, the family was honored that Paisley was nominated. Five finalists will be announced in September. When the family went to Mexico City, Paisley’s Pals Instagram account came to the notice of another humanitarian group, When We Band Together. Officials there asked Paisley if she wanted to raise $1,000 for the Hope and Peace Center and the Moria Refugee Camp in Greece. Paisley’s teacher Catherine Neis agreed. “It’s amazing what she does and the difference she makes in our world even though she’s just a kid. Jones said Paisley’s Pals is hoping to continue to involve children at school and in the community to make superhero capes. The goal is to run a fundraising drive in May for mental health awareness month, since the capes will be used in counseling refugee children. As Paisley explains her outreach to her classmates, they get excited about helping those in need. Neis reminds the class that the Holy Family fled to Egypt to escape danger, making them refugees. Refugee kids today also are escaping perilous situations. Paisley said, “They can only take a little bit of stuff with them. “Families need so much because they can’t take more than they can carry. 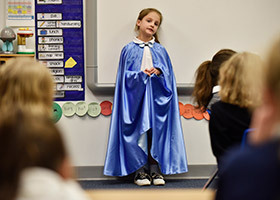 The children experience a lot of stress and could be blessed by discovering their own super powers,” explained the young member of Good Shepherd Parish in Colleyville.